Elizabeth Welch’s work is greatly inspired by natural forms, carefully using photos from researching trips and wildlife reference books. Each piece is made painstakingly by hand, using borosilicate glass; a hard glass mainly used in scientific and functional applications due to its strength and durability. 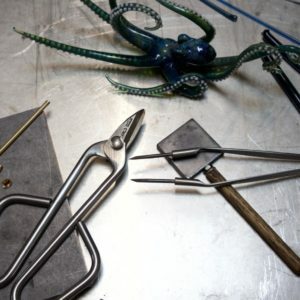 Rods of Borosilicate glass are melted using a surface mix oxygen and propane torch to create colourful and quirky creatures and sculpture. 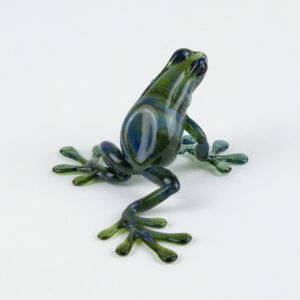 Colour is given to the glass using various different metal oxides in particular silver, gold and germanium oxides. Elizabeth buys and imports pre-coloured rods of Borosilicate glass from the USA to get consistent colour and compatibilities between the glasses. After gaining financial and advisory support through the Prices Trust Enterprise Programme Elizabeth now works out of her studio in Angmering, West Sussex. 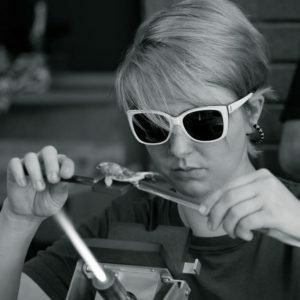 She strives to learn and push the boundaries of her abilities and the glass.